Photographer: I know this will be *difficult* for you right now, but please put your hands on your knees and hold still. Isn’t this picture endearing or what? He seems good-natured, the kind you know has a sense of humor! The photo is so tiny too, which makes it even cuter! It isn’t bigger than 1″ x 2″ and with the frame 2″ x 3″. With the crease in the pants, the wide lapels and the baggy suit, this tomfoolery of a photo was most likely taken around 1910-15. 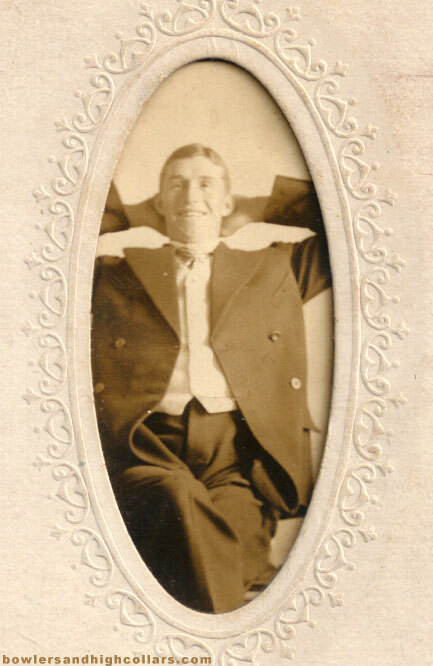 This entry was posted on Friday, April 10th, 2015 at 1:37 pm	and tagged with 1900s-1910s, edwardian, Funny, relaxed pose, smiling and posted in Cabinet Photos, Gentlemen, Humorous. You can follow any responses to this entry through the RSS 2.0 feed. Certainly an amusing picture which makes a change from the more formal and stiff studio pictures of the period. I wonder whether this was a “snap” taken either before for after the proper shoot, either way it is a great addition to your collection. It’s so small it must have been cheap to have it done, hence the fooling around! What’s amusing is the frame, making it so formal looking!